This time of year, I find myself seeking out traditional comfort foods. Ones that I didn't necessarily grow up with and don't otherwise choose to make or eat, but whose undeniable warmth and heartiness I crave. 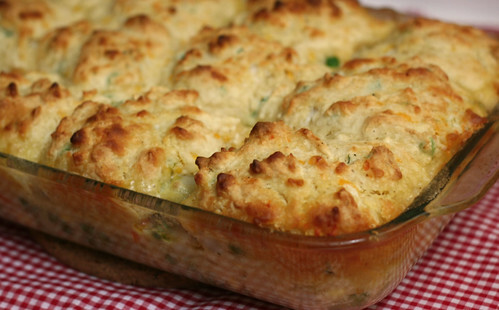 I came across this veggie pot pie recipe while I was poking around my Gourmet Today book, and even just thinking about it warmed my heart a little bit. Spending a lazy weekend afternoon in the kitchen chopping vegetables and slowly putting this dish together felt like the ultimate wintry privilege. 1. Combine pearl onions, water, 1 tablespoon butter, thyme sprig, 1/2 teaspoon salt, and 1/4 teaspoon pepper in a 2-quart heavy saucepan and bring to a boil. Reduce heat and simmer, covered, until onions are tender, about 8 minutes. Drain in a sieve set over a bowl; reserve liquid and discard thyme sprig. 2. Meanwhile, heat the remaining 1/2 stick of butter in a 12-inch deep heavy skillet over moderately high heat until foam subsides. Add chopped vegetables, mushrooms, garlic, chopped thyme, and 1/2 teaspoon salt and cook, stirring occasionally, until vegetables begin to brown (bottom of skillet will become crusty), about 15 minutes. 3. 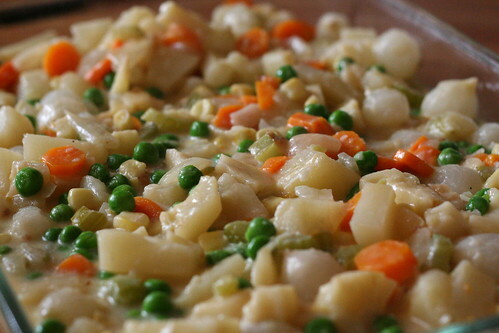 Sprinkle vegetables with flour and cook, stirring, for 1 minute. Add reserved onion cooking liquid and milk and bring to a boil, stirring and scraping up brown bits. 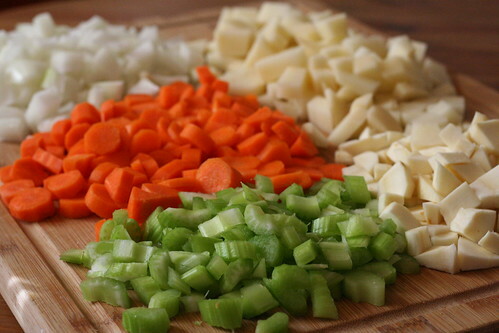 Reduce heat to moderate and simmer, covered, until vegetables are barely tender, about 10 minutes. 4. Remove from heat and stir in peas, pearl onions, and salt and pepper to taste. Pour into a 9x13-inch baking dish. 5. Put a rack in the middle of the oven and preheat to 450F. Whisk together flour, baking powder, baking soda, salt, and pepper in a large bowl. Blend in butter with your fingertips or a pastry blender until mixture resembles coarse meal. Stir in cheeses and scallions, add buttermilk, and stir just until combined. 6. Drop biscuits onto filling in 12 equal mounds, leaving spaces in between. Place baking dish on a foil-lined baking sheet and bake until topping is golden and filling is bubbling, 25-30 minutes. Let stand for 5 minutes before serving. This feels to peaceful. It just looks comforting and perfect for a chilly night! Now this is comfort food! I am still nibbling around the edges of liking pot pies, but perhaps I will give this one a try. If nothing else, I will be sure to try the cheddar-scallion biscuits. Yum! pot pies are awesome as a rule, and this one's no exception. i'm particularly enamored of the cheesy bread on top. bravo! This looks delicious!! And those photos are stunning!! I definitely want to give this a try! So perfect for winter! This is such a beautiful dish. Looks yummy and comforting. Love the topping! Thanks for the recipe. :) I made it (with a few modifications) and it was delicious! Thank you so much for posting this recipe! This has been added to the regular dinner rotation at my house. I make it without the onions and parsnips, and instead add green beans and an extra potato or two. This is so delicicous!